May 23, 2016 – Cassini orbited in Saturn’s ring plane — around the planet’s equator — for most of 2015. This enabled a season of flybys of the planet’s icy moons, but did not allow for angled views of the rings and the planet’s poles, like this one. But in early 2016, the spacecraft began to increase its orbital inclination, climbing higher over the poles in preparation for the mission’s final spectacular orbits in 2017. This view looks toward the sunlit side of the rings from about 16 degrees above the ring plane. The image was taken with the Cassini spacecraft wide-angle camera on February 26 2016 using a spectral filter which preferentially admits wavelengths of near-infrared light centered at 752 nanometers. 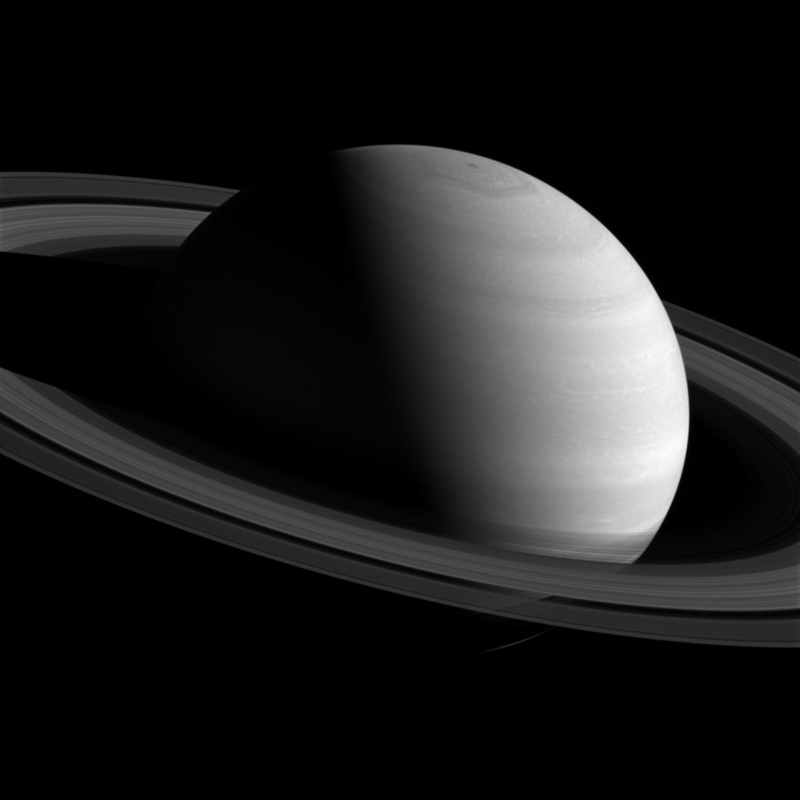 The view was obtained at a distance of approximately 1.7 million miles (2.8 million kilometers) from Saturn. Image scale is 103 miles (165 kilometers) per pixel. By late November, the Cassini spacecraft will be on a path that will carry it high above Saturn’s poles, approaching just outside the planet’s main rings — a period the mission team calls the “F-ring orbits.” After 20 F-ring orbits, Cassini will begin its Grand Finale event, in which the spacecraft will pass 22 times between the innermost rings and the planet before plunging into Saturn’s atmosphere to end its journey on September 15, 2017. The Cassini mission is a cooperative project of NASA, ESA (the European Space Agency) and the Italian Space Agency. The Jet Propulsion Laboratory, a division of the California Institute of Technology in Pasadena, manages the mission for NASA’s Science Mission Directorate, Washington. The Cassini orbiter and its two onboard cameras were designed, developed and assembled at JPL. The imaging operations center is based at the Space Science Institute in Boulder, Colorado. The University of Colorado’s Laboratory for Atmospheric and Space Physics contributed and operates the UltraViolet Imaging Spectrograph (UVIS) instrument on Cassini. Larry Esposito of LASP is the principal investigator for UVIS.